GO Outdoors is a leading retailer in outdoor equipment and clothing. Founded in 2004, the company now has over 50 stores across the UK. Weather is one of the most important factors in the company’s business and one aspect of the business strategy it cannot accurately predict or influence. Whereas warm weather is undoubtedly good for business, it also causes temperatures to soar in the stores. In hot weather, some of the in-store mezzanine levels registered temperatures in excess of 35 °C, making conditions uncomfortable for both customers and staff. GO Outdoors wanted to install a green, low cost alternative to air conditioning and assessed a number of different technologies and manufacturers. Next to capital cost, operational and energy efficiency were important factors in the decision making process. All things considered, evaporative cooling systems from EcoCooling were chosen to be installed in all new stores across the UK. Evaporative cooling is a very simple method of cooling air without using refrigerants. A direct evaporative cooler, using wetted filter pads, cools air by bringing it into contact with water. Water evaporates into the air stream and cools it. Evaporative coolers use the completely natural process of evaporating to cool air rather than the energy intensive compressors used in air conditioning systems. They also work as part of a mechanical ventilation system, ensuring fresh air is brought into the building, avoiding any stuffiness and recirculation. In addition to the more natural ‘feel’ of fresh air cooling, evaporative cooling is considerably cheaper to run than air conditioning in the moderate climate zone the UK is located in. EcoCooling predicts the annual costs per GO Outdoors store to be just £900 as opposed to £12,000 per store annually for air conditioning. The performance of evaporative cooling is dependent upon the temperature of the air and the relative humidity. The higher the temperature and the lower the humidity the greater the cooling. In the UK during a typical hot period the ambient temperature approaches 30°C. This coincides with a relative humidity of under 50%. As the air passes over the wet pads it will typically cool down to about 22°C. Saving energy with the evaporative cooling system means, that not only are the annual operating costs lower, but GO Outdoors will save 50 tonnes of carbon per year compared to air conditioning systems. Installation was finished in record time, during normal working hours without disruption to store’s operation. 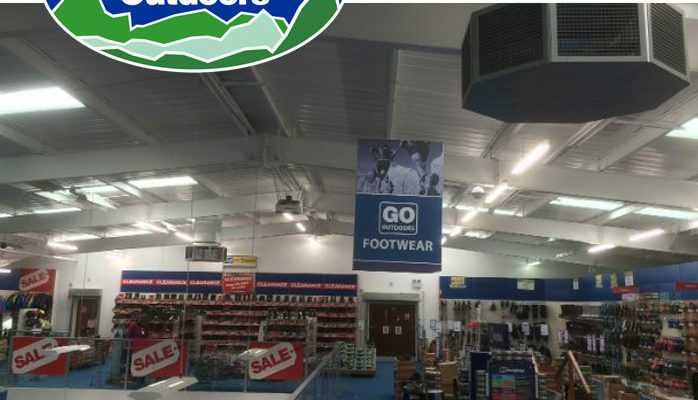 The GO Outdoors store in Taunton, first to be completed, reported a comfortable 21 degrees Celsius on the mezzanine floor throughout the summer.